Welcome back to the “new and improved” format for Speaker’s Digest. You may notice that we are combining this monthly newsletter with our new BLOG, which is now available on our new website and updated regularly each month. Future issues of the Digest will update you on those postings (in case you somehow missed them) as well as keep you apprised of some of projects EMS is working on with our clients. Posting these articles directly onto our website helps with those SEO investigators, and by emailing you links to the articles, we’re doing our best to keep you connected to regular ideas that will help you improve your communication, presentation and leadership skills. Regional Director Training. We continued our work with the American Jewish Committee (AJC), leading a two-day Executive Presentation Training workshop for their regional directors from across the U.S. This global advocacy organization, working to advance human rights and democratic values for all, as well as to enhance the well-being of the Jewish People, began working with EMS last winter. Executive Speech Coaching. EMS returned to Baxter Credit Union (BCU) to lead a three-day “hybrid” workshop for members of their executive team. In addition to working together as a group, each participant went through a private speech coaching session to enhance their presentations to internal and external groups, including the organization’s board of directors. BCU is a full-service credit union with 500 employees and 200,000 members across the U.S. Virtual Presentation Training for Emerging Leaders. We led large-group seminars for two separate cohorts of emerging leaders (the Leadership Lab) at Wells Fargo, a longtime client of EMS. We custom-designed these workshops, entitled Enhancing Your Virtual Presentations, to help participants improve the quality of their participation in conference calls and webinar-type presentations. Did you get to see the short speech that House Speaker Paul Ryan gave to Congress shortly after last month’s tragic shooting at the Republican team’s baseball practice in Virginia? We found his words, his message, and particularly his presentation style to be quite powerful and moving. 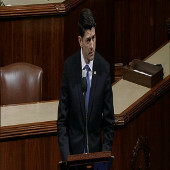 See our blog post with more thoughts on why Ryan’s speech was so effective. When you want your team members to deliver an important message to key customers, it requires more than simply giving them words to say. 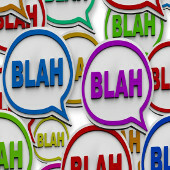 In worst case scenarios, these phrases are barked out, mumbled or raced through, and easily misunderstood because of poor delivery technique. It’s not enough to SAY “Thank you”—your team members need to demonstrate it as well to your customers. Read our blog post. We recently helped a group of executives prepare for key presentations in which they sought to motivate both their employees and their clients about the company’s new products and ideas. In our on-site training program, we emphasized important techniques that would enhance their appeal. Read our blog post here. Gain greater confidence and conviction when speaking to large or small groups. 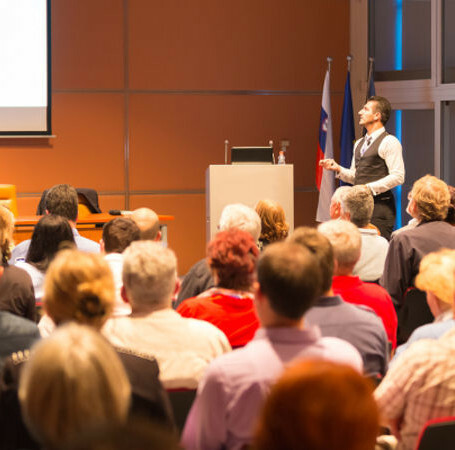 Learn to deliver organized, focused presentations without distracting language. Hone your own natural style of communication for any situation. Begin to see presentations as we do: as opportunities, not challenges!